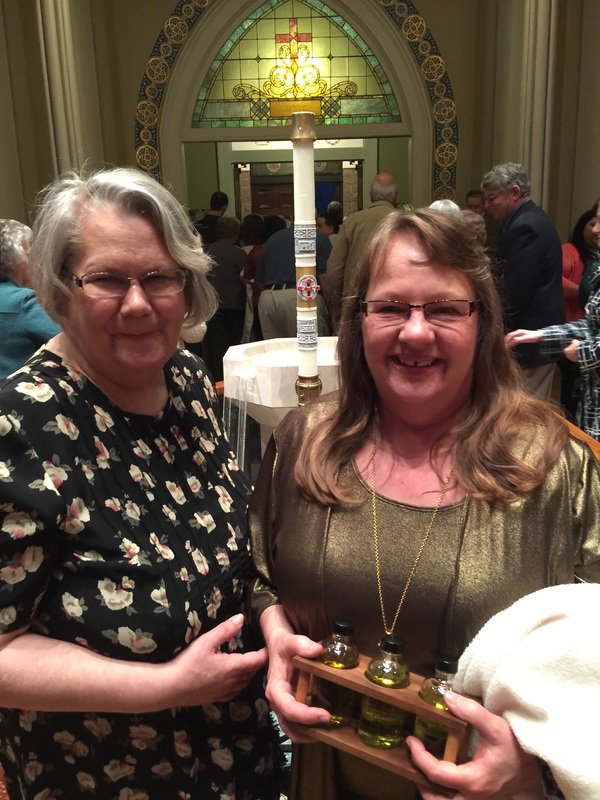 Mary Lou Fischer and Jackie (Deacon) Mescall received the Holy Oils representing SLDM at the Chrism Mass on March 31, 2015. Never an empty seat in the house! Otherwise known by many as the most prolific Mass of the year, you surely would not be dissappointed if you are called to attend. 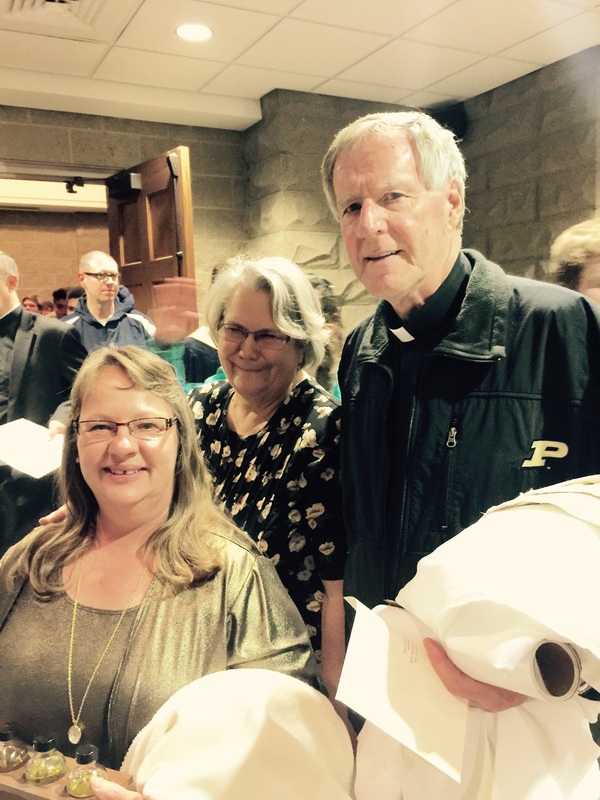 Traditionally, in the Diocese of Lafayette-in-Indiana the bishop gathers together with the priests of the diocese at the Cathedral to celebrate Chrism Mass on Tuesday evening of Holy Week. 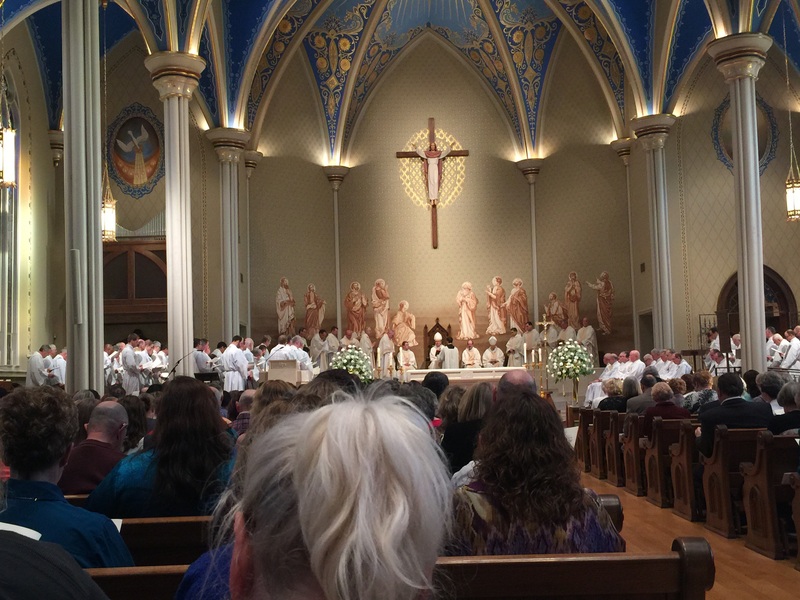 This beautiful and symbolic Mass manifests the unity of priests with their bishop when these holy men renew their priesthood vocation, annually. 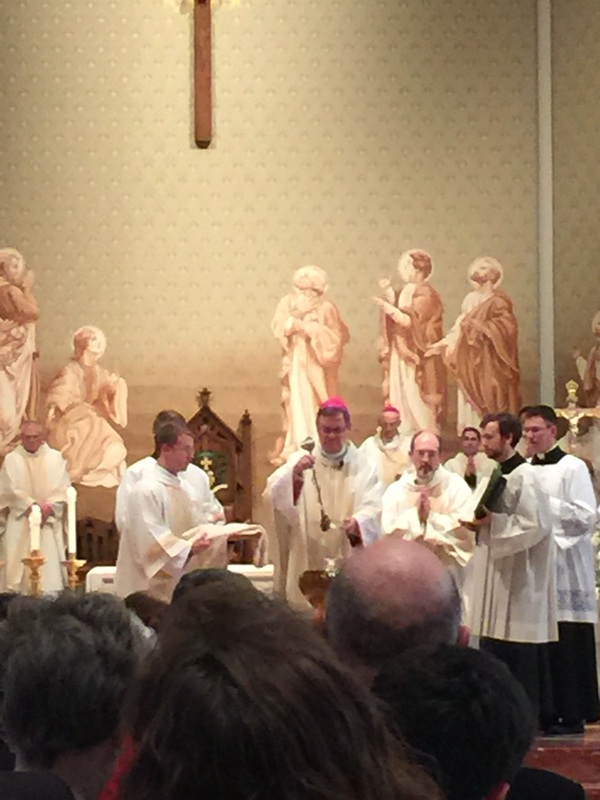 On March 31, 2015 Deacon Mike Mescall from SLDM was an assisting Deacon to the bishop and his five concelebrants. 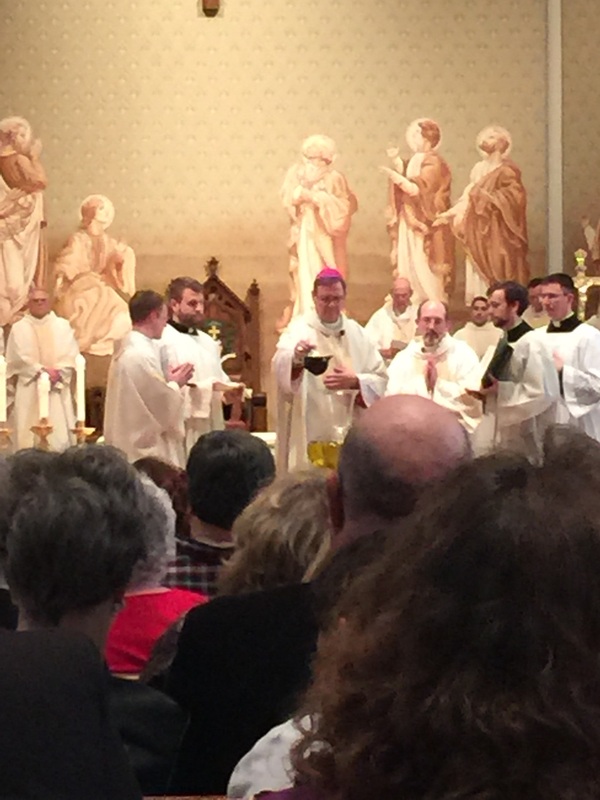 The bishop blessed three oils, the oil of catechumens, oil of the infirm and holy chrism which are used in the administration of the sacraments throughout the diocese for the year. Representatives from each parish in the diocese come forth to receive the Holy Oils from the bishop. Any unused oil is burned with old palms used in the distribution of ashes, when Lent begins on Ash Wednesday. Psalm 23:5 reads, “You anoint my head with oil,” signifying favor and strength from the Lord. Psalm 45:8 reads, “You love justice and hate wickedness; therefore, God your God, has anointed you with the oil of gladness above your fellow kings,” signifying the special designation from God and the joy of being His servant. To be “the anointed” of the Lord indicates receiving a special vocation from the Lord and the empowerment with the Holy Spirit to fulfill that vocation: Jesus, echoing the words of Isaiah, spoke, “The spirit of the Lord is upon me; therefore, He has anointed me” (Lk 4:18). St. Paul emphasized “God is the one Who firmly establishes us along with you in Christ; it is He Who anointed us and has sealed us, thereby depositing the first payment, the Spirit in our hearts” (2 Cor 1:21). It is safe to say, the symbolism of oil is rich in sanctification, healing, strengthening, beautification, dedication, consecration and sacrifice. We pray to You, O Lord, through Mary the mother of all priests, for Your priests and ours. Amen.